Room to Grow reached out to Santini to have him participate in their annual Spring Benefit. With his One Love design overlaying the Room To Grow blue, Santini went to work live painting the remaining space of the canvas, pulling words of positivity that he heard spoken during the event. The painting then went up for auction, the proceedings of which went on to benefit children born in poverty, in hopes to bring about higher quality early education, and improved livelihood. Santini was asked to live paint names, initials and words of positivity on card holders and luggage tags for the opening of Mack Weldon’s inaugural retail headquarters at the Hudson Yards. 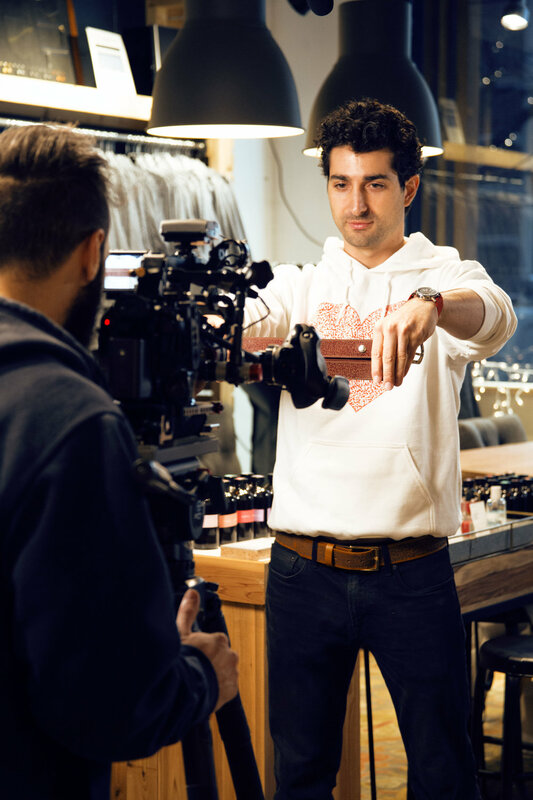 Santini worked for over 5 hours doing live customizations, while also interacting with excited customers. On International Women’s Day, Santini was asked to live paint on stage during presentations about equality, freedom and positivity. The event was sponsored by the United Nations and European Union. Santini was asked to introduce his designs onto the customizable apparel of Saintly. 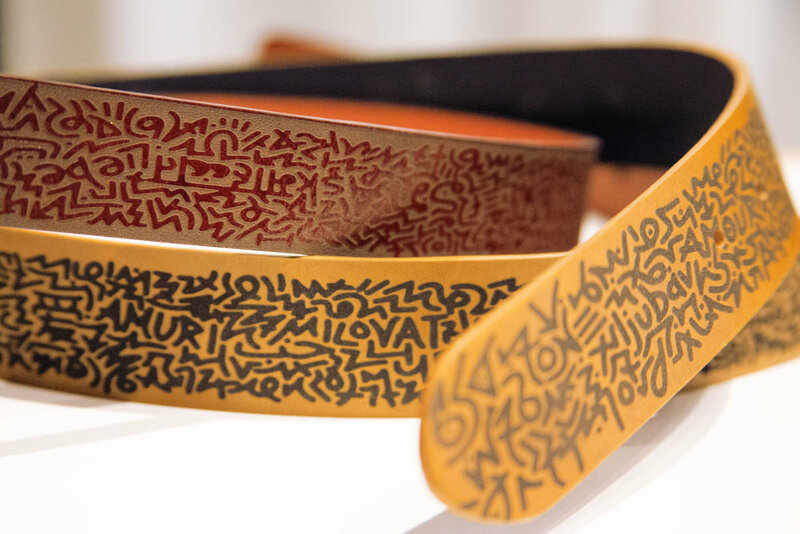 Working with the Saintly designers, together they produced a genuine leather belt with the customers’ words of love and positivity, in Santini’s original design. After falling in love with his style, the owners of Snazzy & Dot invited Santini to introduce his designs into their products. This resulted in wonderfully soft and colorful cashmere scarfs, flowing with words and love and positivity in Sanitin’s original style. When asked to engage with the Self Portrait Project residing in the Empire Stores in Brooklyn New York, Santini was inspired to produce a user generated mural that would grow with every photograph taken. When participants were interested in taking their photo, Santini asked them to provide a word or phrase that explained what love meant to them. As they then took their portrait, Santini wrote their words, spanning many languages and themes, onto the wall. The result of this action produced a series of portraits where the walls behind the participants evolved with their definition of love. This produced a stop motion animation like video of the wall progressively expanding with positive, inspiring words behind each smiling face. Bloomingdale’s hired Santini to customize purchases at the store’s newly renovated Carousel concept in Midtown and Soho. Santini painted shoes, bags, shirts, pants, chocolate boxes and more. On Valentine’s Day 2019, Santini painted a One Love mural on the windows at 59th street. Santini continues to have an ongoing partnership with Bloomingdale’s, often doing live customizations, and window murals. When the owner of Maison 10 contacted Santini to paint this store front window, he did not hesitate to say yes. Santini filled the window with his original design, leaving the silhouette of a heart surrounding the Maison 10 logo. The window greeted the busy shoppers of 5th avenue for the month of February, encouraging them to look up and enjoy the view. Thompson Ferrier asked Santini to create a candle line that spoke to his core. For the past 10 years, he’s been living in NYC and recently found his life's purpose is to spread love and positivity. He wanted to create a way to spread that message in the home through scent, and thus his candle line was born: One Love, NYC Skyline and Positivity. Words of positivity are hidden within his geometric motif to create a universal connection. When scaffolding went up around the Thompson Ferrier office, Santini painted the windows with words of optimism to create a more exciting outlook during a time of reconstruction. Maxim Magazine hired Santini to create a unique experience for their December Issue launch party at Art Basel in Miami. After creating a new cover for Basel and painting all of the windows in his geometric motif, he live painted a magazine that was put up for auction, and did live body painting on guests at the event. — Susan Kilkenny, SVP Integrated Sales & Marketing, MAXIM Inc.